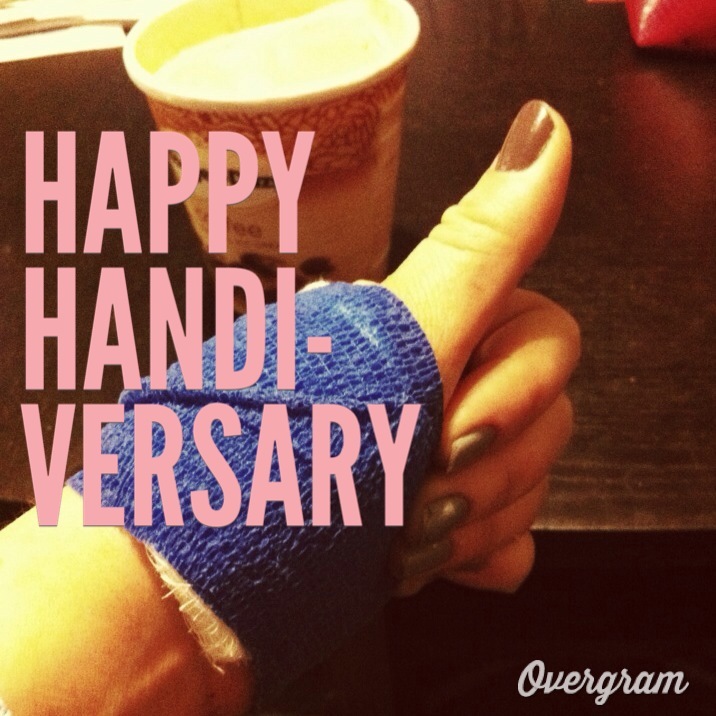 It’s been one year since I accidentally sliced my hand open with an xacto knife. While hanging pegboard, I had about had it with a drywall anchor that wouldn’t sink flush with our stubborn old plaster walls. This was like the third or fourth one and I was losing patience. The plastic form would get about halfway into the wall before it would smush to the side. I had had enough of it, so I reached for the craft knife on my desk a few feet away. Now, keep in mind, I have spent hundreds of hours of my life meticulously cutting intricate designs from paper without a problem. WHICH IS KIND OF AMAZING considering that I am quite the klutz in real life. Needless to say, this wasn’t my first rodeo; I was comfortable wielding this tiny weapon. Ok, so then it happened. I cut the anchor successfully but was using my left hand to brace the wall. Instead of doing the right thing and cutting away from my body, I did the other thing and the fresh blade incised just below my left thumb. It was a very long second before the blood rushed to the surface and I screamed. It was a Wednesday afternoon and I was the only one home. Thankfully, we live literally across the street from an emergency room. I can only imagine the mess if I would have had to drive myself to the hospital. Phew. I need a towel to wrap this. I need to make sure the dogs are inside. And then I walked over. Surprisingly, for me, (I can be quite dramatic) I was playing this very cool. Upon walking into two wrong entrances and calmly explaining my situation to two different sets of receptionists on duty I dry-eyed made my way across to the ER. I called Drew and balancing on a breath I managed to spew out the words “um so I need our insurance information?” My pitch increasing with every syllable, “I’m in the emergency room. But everything’s ok… you don’t need to leave work.” I sounded like a pubescent boy by the end of the sentence. Good thing he knows better. Before you could finish cooking a pot of rice he was in the ER room holding my good hand. While waiting for him, however, I called my mom to let her know that I wouldn’t be able to email her that thing before 5 o’clock. Told her what happened but not to worry. Ha. She said she ‘happened to know’ somebody ‘who had the same thing happen’ and the doctors weren’t careful and “THEY HAD TO AMPUTATE.” Cue my freak out. It’s no secret with my friends and family that I love making things by hand and dream of hosting my own tv series teaching people how to make things too. Like Martha, but with a splash of Rachel and a little bit of Alton. You know. But to get that gig, I really need to have a ‘tv look’; preferably, that means pretty hair, big smile, small waist OH AND two of each extremity. Preferably. I’m sure there’s some progressive studios out there and that’s cool, but really, who wants to see craft demos by the one-handed lady? I mean, yeah for a second, but then it would get weird and everyone would feel uncomfortable. Whatever. Ok, I’m just really glad I have two hands. OK SO, the doc zapped my hand with some drugs and proceeded to thoroughly clean my wound and stitch it back together. Although I couldn’t feel it, I could kinda almost stomach watching him sew my flesh back together. Pretty soon he was done and writing me a prescription for painkillers– which we quickly filled and accompanied with lots of ice cream. 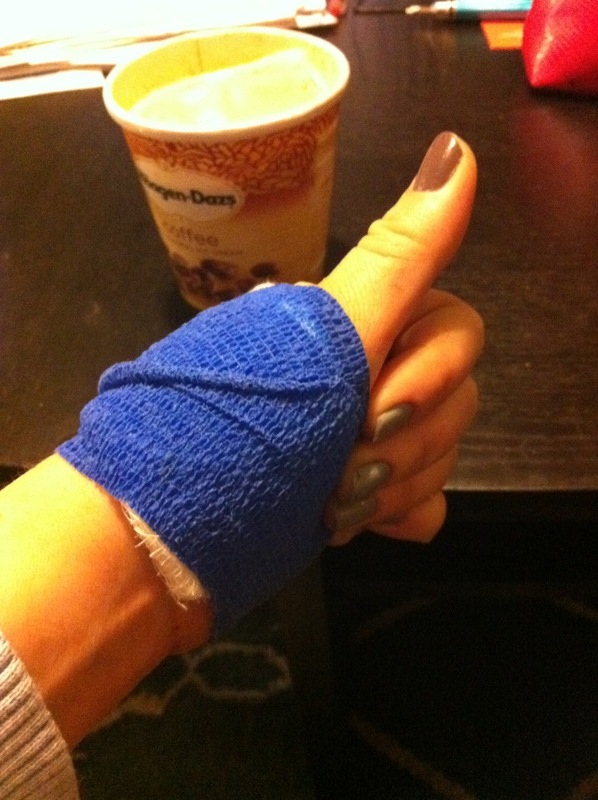 A lot of nerve endings were cut, so the whole base of my thumb was numb for several months. A year later, I have most of the feeling back in the digit that separates us from apes. When it was healing and I’d have to wash it out and change my bandages, I’d look at it and break down. Now, I’m sure that a lot of this sadness was a side effect of the prescribed opaites. But some of it was really real. I would squirt the cucumber melon scented foaming soap onto my scar and gently rub it with my right fingertips. The sensation of feeling the stitches and seeing me feeling the stitches but not feeling me touching the stitches was upsettingly trippy. Cue my sporadic sink-side sobbing. My pretty hand would never be the same again. I’ll always have this mark. I’ll never be the same. I have never held a tool the same way again. I’m even timid around wine openers, seriously. Not out of fear, now out of respect. I look at the scar on my hand with pride and caution. The funny thing is that I’ve always talked about getting a craft knife tattooed to my forearm. Well, now I don’t have to. 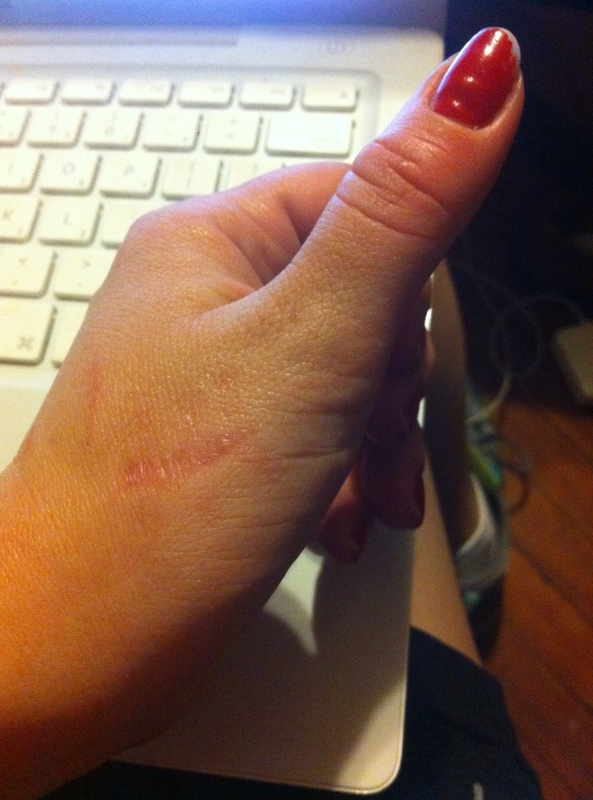 I’ve got a much more badass scar instead. This is how my scar looks today. Ok so, because I love you and I respect your possible desire to NOT want to see bloody gory nasty photos, I did not include them in this story. However, for all you freaks out there that wanna see the gushy stuff, those photos are below. Posted in Carpentry, Uncategorized and tagged blood, bloody, diy, ER, fml, freakout, hand, health, medical, medicine, oops, Safety, scar, tattoo. Bookmark the permalink.